Now that you've prepared your background vocals the correctly, it's time to mix them. Background vocals can be the hardest tracks to get just right in mixes. They often disappear into the distance or are awkwardly close to the listener. In this tutorial Fab Dupont gives you the tricks necessary to nail your background vocal sound. Good morning children, today we are going to bring the background to the foreground. 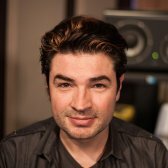 We're gonna look at good techniques on how to handle those elusive background vocal tracks. Here we go! Let's listen to the lay of the land. My example today is a track from Banda Magda called 'El Pescador'. And I have female background vocals, male background vocals. I left the lead in this session. So we have an idea of what this song is about. Let's listen to it raw. No plug-ins, nothing. And then we will go from there. Obviously, there's only the Lead Vocals, the bass and the background vocals. Otherwise this song would be 160 tracks. And we wouldn't know what to do with ourselves. But that doesn't change anything to the stuff I wanna show you now. Whether you recorded them yourself, or they've been handed on to you, there's a strong chance that you will have different kinds of distances between the vocalist and the microphone. If you listen to this track, the lead is very close. Now if I listen to these other background vocals here, they are very close to the mic. They are kind of in between the two. That distance between the vocalist and the microphone is gonna change a lot the stuff you do. The problem with background vocals, even if I solo just this lead and these four backgrounds, by the same singer, probably recorded the same day, on the same microphone, at the same distance, with the same pre and compressor, which is the worst thing you could possibly do, by me, nonetheless, sounds like this. Lead and full backgrounds. Here's nine. Lead and and eight backgrounds. Each individual sound is great. That's the lead, here's another background. But, all eight backgrounds plus the Lead create a problem. There's a mask, there's a lot of energy in that 'mmmm' space. And that's a problem, specially since towards the end of the song we have another eight tracks of these, plus a bunch of guys. Which means it's gonna sound muddy. So, since you noticed that we send all eight of these tracks into a sub, why don't just put an EQ on it? Like this. And find that problem and remove it. I'm going to mute the lead and listen to just the background. It does get rid of that 'mmmm' thing. But, does it sound good? No. Now it's spitty. So that's not gonna work. I guess it's OK but it's not great. The problem, which is prevalent with background vocals, that are recorded on the same microphone by the same person at the same time, with the same pre-amp with the same mood, is that the peaks of the room and the peaks of the relationship between the vocalist and the microphone are the same on every track. So you multiply that by eight. Which means the EQ you have to apply at the sum of all that stuff is enormous and ruins the sound. A better way of working although it seems tedious is to function this way. Get rid of this guy, it serves no purpose. Pick one guy that you're gonna use on every single track. We can use the same one, let's be consistent here. Listen to just that track. You hear it, right? That sound's nice. Let's compare to the next one. Kind of the same but not quite. So you can copy this. So now we're able to apply specific EQ to each and every separate background vocal. I can apply a little more EQ if I need to to be able to get rid of the problem without affecting everything else. And, since she may have moved a tiny bit, or since she may be singing a different note, and frequency and pitch are related, as you remember, then I can change the frequency of the EQ a tiny bit and have some kind of overlap frequency allowing for a fuller sound. As opposed to just slapping an EQ on the whole thing. This one, the third one, sounds like this. She's a little closer to the mike on number 3 so I'm gonna use the same as number one. So we now have four EQs that are sensible the same on four tracks. But what we got is usable. How would it sound might you ask yourself, if we just use that one EQ that we like on the individual tracks on the main track? It would sound like this. I'm gonna copy it, mute these and listen to this. This is with one EQ across all four. Listen to the 'hummmfff' part when it's like 'Luna'. One is clean, the one that is discrete on every track and one is muddy. Multiply that by 50 tracks of background vocals and that's the difference between a muddy background vocal track and a clean background vocal track. This of course doesn't mean that I'm not gonna use that bus to process all of them together. I will, for several reasons. A - To save DSP. B - To save brain shart. To avoid having to move eight different plug-ins or change 8 plug-ins every time I wanna change something on all eight tracks. But, to fix mud problems I do it individually on the tracks if they bother me. If I want it super thick and in your-face background vocal then I don't touch anything. But in this particular case it was annoying me artistically so I did it this way because I know is the cleanest way and I won't be tempted to EQ more or compress or do anything like that later. Let's listen to this guy. It's a little lower but I think this EQ would work. Let's check it out. Maybe it was better before. I'll decide, I may be a little too shy on this. I'm gonna use the one that was for darker stuff. You hear the peak coming in, right? OK. Same as the first brown one. And this one on the other side. Same as this one. Cool. We are basically using individual EQs on separate tracks as a compressor of source, to avoid that peak. And now I'm ready to make sound. I'm no longer fixing, I'm gonna start mixing. But before we get there let's listen to BGVs that have been recorded far away from the mic like those guys over there. Each pair has a direct mic and a stereo mic. The stereo mic is actually more present than the mono mic. We're pretty far away from this sound. With a far away sound you're not gonna have the bottom problem. It's not gonna get as muddy. Even if you put all of them together. There's a little bit of a mask in the bottom. I can remove it very easily. When you have a whole bunch of tracks like this recorded with the open microphone for backgrounds, it's always a good idea to hi-pass. But I don't have to tell you that because you hi-pass everything, right? Here we go. So that is very simple, because there's no peaks and no dynamics that are not compounding together to make these big peaks on the sum, you could just use one EQ on everything and be happy. The problems you might find with background vocals that are recorded far away, that will compensate for the fact that you will not have the peak problems are: A - They might sound a little roomy, a little bit demoy because they have that weird room, unless you recorded at Abbey Road, you may not have the best room sound. So you might wanna try and hide that. The second problem is that you find them to be dark. Let's compare with the lead vocal. And then she comes in. In this particular case it's kind of nice to have this bunch of fishermen hanging out in the back while she's in the front telling the story. However this is a big difference. You might wanna try opening up the top across all tracks. Another advantage of doing this brightening is that you will hear these 8 background vocals more because you hear the highs more in a crowded mix. And if you hear them more you can bring them down. If you bring them down it leaves more room for the rest of the track. So if you wanna highlight parts of the background vocals, open the top a little bit. They will come through without raising the level which means all the stuff that's at the bottom of that track will not mud the entire track up like they would if you just tried to raise the whole level. Also, brightening all tracks across one EQ gives a little bit of that together shine. It kinds of melt together, it's a little of a sauce. It may be subjective but I kind of dig it. The combination of those two benefits makes it a good idea to check if you can sneak in a little bit o high-end without becoming sibilant across your background Subs. I'm gonna make a leap of good faith and imagine that these are about the same. How do these sound? Fierce. These are actually closer to Magda's vocal miking wise, but they don't have that bump at the bunch. Check out. I think that's a great recording, I'm no touching it. As a reminder we started here. And with just these few EQs. We haven't looked at these. Same deal as the first four, I'm gonna hope for the best and copy the EQs. There you go. And it will sound like this. There's a little problem here. That by itself sounds horrible. See, if we didn't EQ these it would sound so failed. I can't use this on the record. But if you EQ it too thin like this, it will come above these guys. Without mudding the whole track. So listening to these bunch of tracks in solo and trying to make them sound the best possible by themselves is not necessarily a good idea. You have to look at it in the context of the musicality of the track. Are they the body of the song? Or are they and added harmonics that you can just neuter and just tuck it on top. It's very crucial to analyze the background vocals. Otherwise you will never see the end of it. Now, this is only EQ, I think there's another one yes, there's these guys here. I think we have everybody happy. The principles of compression on background vocals, are the same as the principals of EQ on background vocals. You better off compressing that track by track. If you just wanna shape the entire level of all eight together then you use the Sub. In this case we already took care of the peaks with the EQ. EQs can be the best compressor in the universe if you use them properly. Let's just compress a little bit. Check out this part here. See there's a little bit of a sway here. I'm gonna use a compressor that we all know and love. The peaks are wonderful, they give me presence. I'm gonna level it with a fairly slow attack. It works better when I turn it on. It's just a little bit of steadiness. That's it. Using a slow attack allows the peaks of the background vocals to peak through, hence the name, peak. The idea here is the same as the brightness on the background vocals. If you let the peaks through, they seem more present, you can tuck them in a little bit, you don't need as much of the body and they still do their job and you hear them well. It's sounds like this with the lead. Notice how it gets a little bit peaky in the bottom in places even tough it sounds fine on it's own and the lead vocal sounds fine on its own, the combination of the two is creating problems. If I add the compressor I don't have that problem. It's safe to assume that's gonna be fine here too. Those are so much thinner that they don't hit the compressor. And the same thing can be said of these other guys here. Let's find a place where they speak more. You want them to speak. See that 'QUE' thing? A little faster, will catch more of it. That would be annoying but with the compressor, just right. If I was not able to make this happen exactly the way I want on the Bus, I would go and compress individual tracks until I'm happy with it. Let's talk about panning for background vocals. How do you think about that? Well, I think it depends on the function. This first part here is a stand-alone part. It's a kind of a lead made out of a bunch of people. So, let's try to recreate a space in a room a bunch of fishermen just hang out. I would try and give it a mass, I wouldn't necessarily keep it as wide as it is right now so I could close it a little bit here. And give more of an entity feel. So for example if you have a song where you have a lead and than the background answer and the BGV is a block of people, then maybe you wanna make it centered so it's more tangible and physical in the middle. I have some tracks in the middle, some tracks slightly on the side. Some tracks more on the side. I've heard and I've read and I've been told, many things like that. 'You have to pan this way', 'and pan this one this way'. Does it feel good in the middle? Does it feel good in mono? Does it feel good slightly stereo? Does it immerse you well if it's all the way open? That's the criteria. There are no technical reasons for one way or the other. Now, for background vocals that are more like this, where you're actually supporting a lead, this is my lead. These background vocals are designed to support the center vocal, right? It's a good idea to wrap them round. They're usually designed to make it wider bigger than life, so then open it completely. is more fun than this. And we wanna have fun. I'm gonna keep it opened. You could consider doing something like this where you have two wide open, and two kind of open, like this. And this is how it sounds. You notice that if you open a little bit less there's more mass in the middle which makes a lot of sense. The question is you have enough room to have more mass in the middle? Maybe yes, maybe no. It depends on the band it depends on other background vocals, it depends on.. there's vocal double or not. Again, it's a question of taste. Here I have the room because there's nothing else going on. But if I had a full band with the piano right here, I probably wouldn't and I'd push the BGs to the side. As you may have noticed by now, except for a few technical issues, it's really a question of common sense. If you have a super high BGV, that's quadrupled, and then a low part that goes with that BGV that's quadrupled, are you gonna put all four low ones on the left, and four high ones on the right? If you're mixing for the Beatles, maybe. Or if you're mixing a record that wants to be like the Beatles, which happens a lot. But if your'e mixing for Kate Perry probably because you want that blended sound where everything is together. So, it's a question of esthetic choice. It's not a question of right or wrong. Reverbs and delays are the same kinds of reverbs and delays that you would use on lead vocals. Space. So you need a little bit of this, probably less on background vocals because you have so many more, you have more room bleed so you have more of a distance than on the lead vocal. However sometimes they are recorded so close that you still need to add the depth back in. Then you need the tail, with the plate and then you need height with a hall, if you're in that kind of stuff and you have the room. What we're gonna discuss now is more specific blending techniques. So you can help background vocals blend together more. And to do so, the way to do it is to use a pitch effect. So I have a send here on the bus of this eight background vocal. It sounds like this, raw. And then I'm gonna fabricate the effect for you in realtime with this plug-in. And then I'll show you a couple pre-tuned effects. So I'm gonna use Pitch 2 which is a standard Avid plug-in. What I'm gonna do is pitch the left side a little bit differently from the right side. And I'm gonna make sure that this is 100% wet. Right? Because I don't wanna hear the direct sound, I only wanna hear the wet sound. This is a very standard practice. People have been doing this forever. They used to use hardware machine from Eventide, Harmonizers, the 910 and 949. A little bit of pitch on the left, a little bit of pitch on the right, and then you set it in and it sounds like this. As a reminder, this is dry. And this is with the effect. You don't have to use at that. And in the context of a whole bunch of stuff, and with the track, and the bass and everything, it's cool. Notice what it does? It blurs the pitch a little bit. And it creates that coarsy kind of effect that's not really a chorus and let's you really kind of blend all those background vocals together by adding some shadow to the pitch. 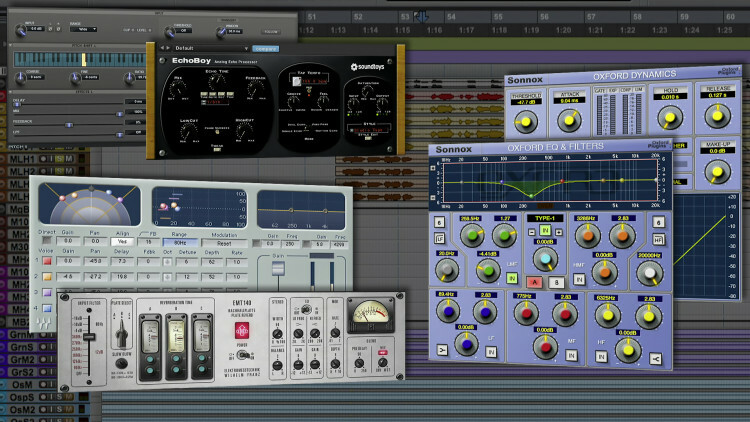 You can use plug-ins from some manufactures that actually do that for you. And add a little bit of randomness a little bit of color to it like for example the amazing Microshift from Soundtoys. You have three different kind. Make sure you are on all wet. OK? Type 2. Super silky, right? Type 3. Compared with the handmade one. This is the pitch one. The Microshift is a more achieved effect because somebody smart spend a lot of time tweaking the parameters so they sound just right. However, the pitch one, you can make it do things and you can tweak it to your liking. So it's a give and take. Here's another one I dig and I use quite often, it's from Waves and it's called Doubler. The Doubler 4 is nice. Because instead of having 2 voices, like pitch, it has 4 voices. Hence the name, Doubler 4. And I'll use the Doubler 4 preset. You have to be careful with Doubler, to remove the direct sound. The cool thing about doubler is that you can change the pan. So I can take some of this stuff put it in the middle like here. Kind of the same family, right? Makes you think that maybe Little Microshift has four voices, maybe not. We have to ask Ken. Another cool feature of Doubler is that you can actually make the pitch change. So you can have four pitches that kind of like do this all the time to create more of a real feel or more of kind of a weird feel. So you have the 'depth' amount here, and that will, I'm gonna exaggerate so you can see it. It sounds like this. if you actually put a little bit of sway, a little bit like this, maybe at different speeds, you'll notice that's it's gonna thicken the whole thing. As opposed to Microshift which will be more discrete now. You can do crazy things with this. And thicken background vocals a lot using this kind of stuff. I'm gonna go back to Little Microshift and I'm gonna add a little bit of that to most of the background vocals to give them blend. And to give them depth. How much am I adding? I'm pulling the number out of my hat. Let's see how it sounds towards the end. It adds a nice shine. It makes it more unified, which is cool. This sounds very dry I'm gonna slap a quick plate on it. Which is what I use mostly for background vocals. Some sort of an EMT Plate because that's the sound we've been listening to for decades. Specially on the main one. The lead is a little loud. We're starting to notice that a lot of the sound of the background vocals is based on the effects you put on them. Why? Because background vocals are supposed to add a supernatural dimension to your track. Right? Either they are answering the lead or they are enhancing the lead or they are trying to make it bigger. The bigger and the more supernatural that they sound, without being insane, gives you kind of a aw feel, which is what you're looking for. Let's add a little bit of a EQ. This techniques are super standard. You just gotta remember to use them. And you'll notice that with the effects, the little pitch sway, the delay and the reverb, those slightly questionable pitchy things here and there no longer bother anyone. For background vocals once you fix the problems as we saw at the beginning, so that you don't have to hear peaks and valleys when you're trying to be creative, the name of the game is contrast. Do you want it to blend together, lead and backgrounds? Do you want it to be separated? Give it a sense of depth. You can play with dry or wet, vocals, and reverbs and no reverbs. Tail or no tail, hall and no hall, delay and no delay. Or the pitch that gives you that stereo kind of feel thing going. Using those tricks you can manage your backgrounds vocals being front or back of the mix very easily. this tutorial is awesome!!! thaks!!!! I liked the tricks with the Doubler - very cool and helpful! Awesome info as usual.. Thanks Fab.. Thanks Fab, great stuff here! Question... I see the Bricasti M7 in your rack. Would you substitute that for one of your plates or halls plugins? Or add it to the list of available FX for your mix? The M7 has been a recent new toy in my setup...I would love to hear how you employ it within your projects. Fab, since all of your tut's are great helpful and awesome I have only two words to say today: Thank you.